Freedmen in this area held services in a brush arbor at the “Old Prayer Ground” nearby as early as 1869. In 1880 the trustees of St. Paul AME Church purchased 113 acres to establish a campground for annual revivals. 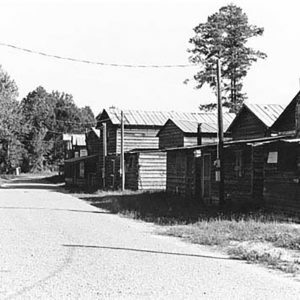 They erected an open-sided “tabernacle” and simple cabins, called “tents,” where worshippers stayed during a week of services. The property also includes two stores, a storage building, and privies behind some of the tents. St. Paul Campground is still used for camp meetings for a week in October each year.